Have you ever heard about the abusive taxi driver who went viral for cursing his passenger? How about the driver who yield a samurai sword to his passenger for refusing to pay extra fare? Did you also hear about the ‘spray modus operandi’ where a taxi driver sprays chemical to the air conditioner vent to intoxicate his passenger making him/her weak, dizzy and/or immobile? Mostly, these were posted on social media and this news about ongoing public transportation-related crimes makes us all alarmed and somehow ‘paranoid’. 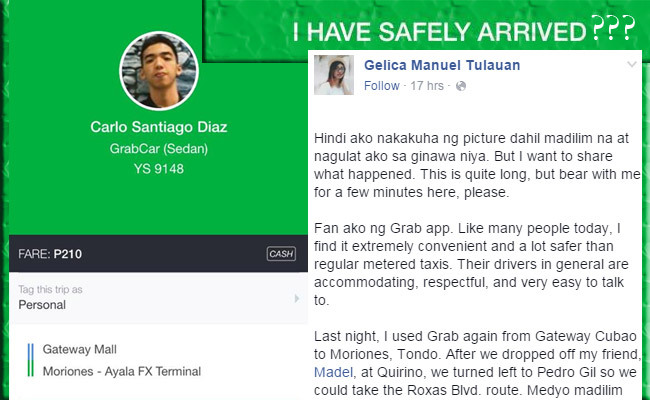 On February 07, 2016, Sunday, a certain Gelica Manuel Tulauan posted her firsthand experience with a GrabCar driver on Facebook, garnering almost hundred thousand likes and thousands of shares only within couple of hours. Tulauan started with acknowledging the convenience and safety of app-based transport services particularly the ‘Grab’ app which she was fond of. She also commended the (mostly in general) Grab drivers as ‘accommodating, respectful, and very easy to talk to’. Going back on February 06, 2016, Saturday evening, Tulauan used the Grab app to hail a cab from Gateway, Cubao going to Moriones, Tondo. She even detailed the routes they took after dropping off her friend named Madel to Quirino. Though there were still establishments open during that time, the street was too dark, according to Tulauan. Because of the reported crimes happening in the Metro, her fondness for detective/mystery films and her hyperactive imagination, she became ‘paranoid’ during the entire travel. So when they stopped in a particular dark spot somewhere, her danger sensors were in high-alert. She wasn’t able to react right away when the driver suddenly stopped and removed his seatbelt; the GrabCar driver took a medium-sized brown bag under his seat then alighted right after. While contemplating how to escape if the driver will do something unusual, Tulauan took her phone out and dialed her friend, Danelyn, to ask for rescue but unfortunately the latter did not pick up. Tulauan was taken off-guard by what the driver did. The driver took the brown bag to a sleeping old street dweller woman who was lying down in the pavement across the street. The two talked for a while then exchanged smiles before the driver went back inside the car. Tulauan felt embarrassed for judging the driver so she kept her silence for a moment. But Tulauan's urge was too strong not to ask if the driver knew the elderly but he answered no. She even probed what’s inside the brown bag he gave her, which he answered food. They aren’t leftovers; they were cooked intentionally to be given away to the less fortunate said the GrabCar Driver. The GrabCar driver named, Carlo Santiago Diaz, is on his early to mid-twenties and studied in Jose Rizal University. He told Tulauan that he and his friends together with his girlfriend do deeds like this often. He even said that he did it on his birthday way back January 30. They are cooking and bringing foods, clothes and blankets to street children along Roxas Boulevard. Faith in humanity is totally restored because of people like Diaz. After all, these ‘pag-asa ng bayan’ proved that in today’s world of crimes, some people are still used by God to share goodness and goodwill.